Com­pared to prob­lem strick­en coun­tries like Spain or Greece, youth unem­ploy­ment in Korea doesn’t seem to be an issue. Offi­cial OECD sta­tis­tics report an unem­ploy­ment rate of 9,6% for peo­ple between 15 and 24 (Jones 2013). 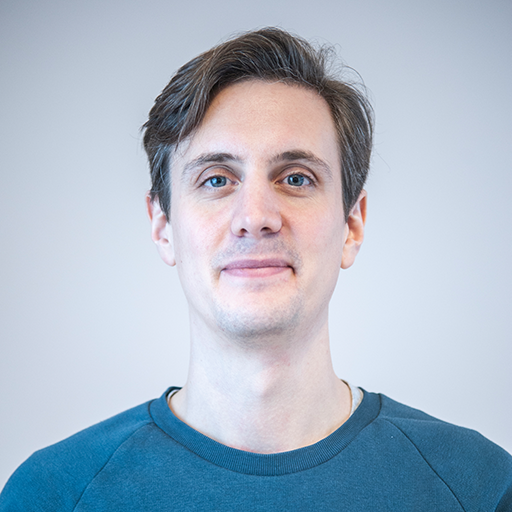 With respect to this low rate of unem­ploy­ment South Korea is out­per­formed by only very few coun­tries like Ger­many and Switzer­land, which have youth unem­ploy­ment rates around 8% to 9%. This pic­ture, how­ev­er, changes dra­mat­i­cal­ly for the num­ber of NEETs (youth not in employ­ment, edu­ca­tion, or train­ing), as pre­sent­ed in the fig­ure below. Accord­ing to recent OECD (2013) edu­ca­tion­al data, NEETs made up 18.8% of the pop­u­la­tion in 2011, a rate also expe­ri­enced in coun­tries like Spain, Greece, or Italy. Inter­est­ing­ly, this num­ber is not dri­ven by peo­ple with low edu­ca­tion­al back­ground, but by peo­ple with ter­tiary edu­ca­tion. 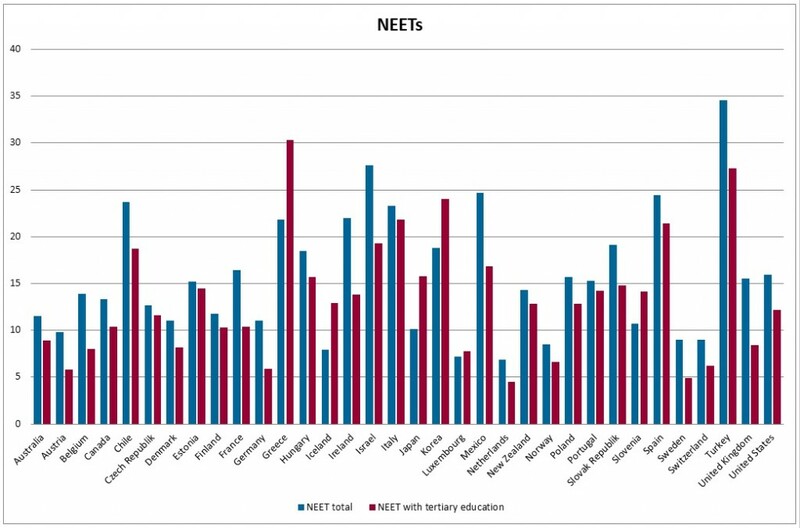 NEETs with ter­tiary edu­ca­tion make up 24%. Only Greece and Turkey have high­er shares in the group of OECD coun­tries. Such a high share of inac­tive, young and edu­cat­ed peo­ple is wor­ry­ing from an eco­nom­ic point of view. They don’t con­tribute to the econ­o­my by delay­ing labour mar­ket entry, but enjoy a very expen­sive edu­ca­tion, plac­ing huge debt bur­den on their fam­i­lies. Over­all, Kore­ans spend 7.6% of their GDP on edu­ca­tion, of which over one third is paid for by pri­vate house­holds (OECD 2013). Youth (15–29 years) not in employ­ment, edu­ca­tion, or train­ing as per­cent­age of total youth. Why is such a high pro­por­tion of young Kore­ans inac­tive? The three main caus­es, which are also inter­con­nect­ed, are (1) a lack of jobs due to decreased inter­na­tion­al com­pet­i­tive­ness and reces­sions, (2) a lack of flex­i­bil­i­ty on the labour mar­ket, and (3) a skills mis­match (see Schmid 2013). Regard­ing aca­d­e­mics the skills mis­match i.e. over-edu­ca­tion is most preva­lent. Almost 86% of all high school grad­u­ates attend col­leges in Korea, as a ter­tiary degree is regard­ed as a tick­et to suc­cess in Korea’s com­pet­i­tive soci­ety. It is said to guar­an­tee social recog­ni­tion and a high income. The Sam­sung Eco­nom­ic Research Insti­tute (SERI) (2012), a pri­vate think-tank, how­ev­er, esti­mat­ed that around 42% of col­lege grad­u­ates are over-edu­cat­ed for the labour mar­ket. Korea is lack­ing skilled tech­ni­cians and crafts­men, not aca­d­e­mics. If these 42% would enter the labour mar­ket right after high school, the eco­nom­ic growth would be 1.01 per­cent­age points high­er, accord­ing to SERI. This growth is vital for an econ­o­my like Korea with a mir­a­cle growth in the past and pro­ject­ed low growth rates due to a lack of com­pet­i­tive­ness and a shrink­ing soci­ety. There­fore the last Kore­an Pres­i­dent, Lee Myung-bak intro­duced “Meis­ter schools”, voca­tion­al high schools for tal­ent­ed youths copy­ing parts of the suc­cess­ful voca­tion­al train­ing sys­tem of Ger­many and Switzer­land. But Korea needs more than just anoth­er elite insti­tu­tion increas­ing the com­pe­ti­tion among stu­dents. The gov­ern­ment needs to address the com­pet­i­tive­ness in Kore­an soci­ety first to make voca­tion­al edu­ca­tion a more viable option. It must be okay for high schools stu­dents not to go to col­lege. They should be able to pur­sue their dream job and not society’s dream jobs. This may also mean to share wealth through a big­ger wel­fare sys­tem, which makes less paid jobs more attrac­tive for high school grad­u­ates. Orig­i­nal­ly pub­lished on ECON+, Sep­tem­ber 29, 2013.